During the westward expansion of the United States and prior to the penetration of the railroads, all overland freight was moved by mules, oxen or horses, whether it was packed on their backs or hauled in wagons. Teams of oxen were best suited for hauling heavy freight wagons across the plains. When traveling in the mountains on treacherous trails or no trails, the mule team was favored. Mules are sure footed, fast, require less food than a horse and are very strong. Some travelers of the old west preferred to ride a mule over a horse noting they had a smoother ride with less sway. 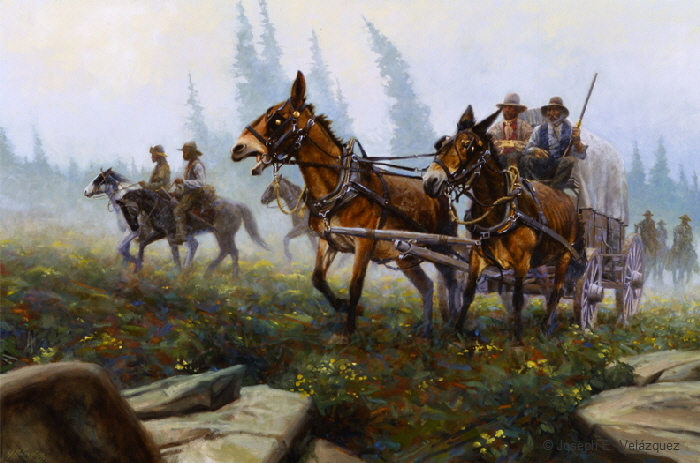 In this painting a team of mules hauls a supply wagon into the high country. It is early spring. If you look closely, you can see mud clinging to the iron tires. Yes, they do call them “tires”.